8280 fire engine with a boom that can be raised. The 8422 motorbike was already covered on this blog. 8412 helicopter with a fully tiltable rotor. But coolest is the 8485 Control Center where we can control a helicopter, a dinosaur or a boat. There is also a new section named Technic Fundamentals that contains excellent animations about gears, differentials, adjustable rotors and similar stuff. A Lego maniac like me cannot go on without getting random Lego sets from time to time, even if he buys enough stuff for himself :) I got this set as an anniversary surprise from my spouse, I was very happy. II. What is in the box? This is a truly modern Technic set. We can hardly find any real bricks - only the lights and the pallet has some of those. The rest is made of beams, joints, axles and other similar pieces. 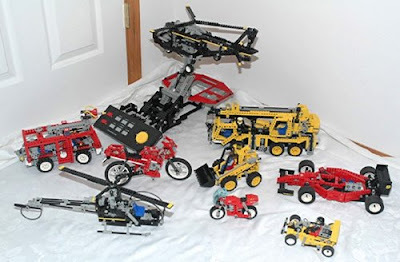 Fortunately there are not many special pieces, it seems to be a good starter set for free building. 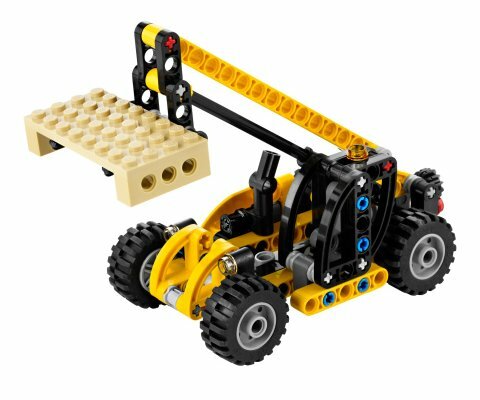 The wheels are not typical Technic wheels, they rotate on axles so they cannot be used as driven wheels. It is a small set having few pieces, so it concentrates on one main function: by rotating the knob at the back we can lower or rise the forks. It includes a pallet too, so there is no need to buy other sets to start playing. Raising the fork is easy but lowering it is not quite smooth. Because of the tension in the mechanism it starts to make small jumps, the pallet falls down quite easily. The B-Model does not have any functions at all: we can build a motorcycle. At least it has a spare wheel that we can use to exchange the wheel on the sidecar. Even though it has relatively few parts, it is obvious that the designer spent more time on the looks than on the functions. The loader has lights at the front and the back, even on the top. On the two sides of the chassis we find two boxes that have an aesthetic role only. On the right there is the engine compartment and on the left we find the driver's cabin. It is not large enough to hold a minifig but even so it is quite detailed - you can clearly see the seat. 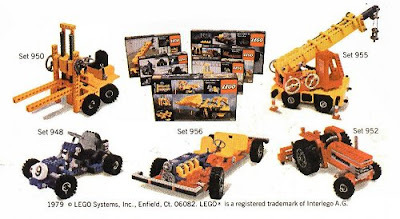 This is a perfect starter set for 7 year old boys. Assembling it is pretty quick, I could do it in less than an hour even though my daughters "helped" me. The function is simple but is entertaining. The parts are generic enough to build other things, although I have not tried that. As a final score it gets 8/10. It has many nice aspects but it gets a small penalty because using this many parts it could have a bit more functionality. For example the 8259 Mini Bulldozer has not just an adjustable dozer-blade but also realistic treads. I finally got it! 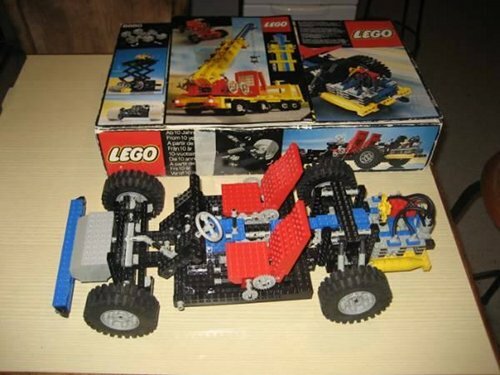 I have the 8860, the last missing Big Car. So far only online but soon in real life too. It is 66CHF (47 EUR, 57 USD) even though it has a box too.